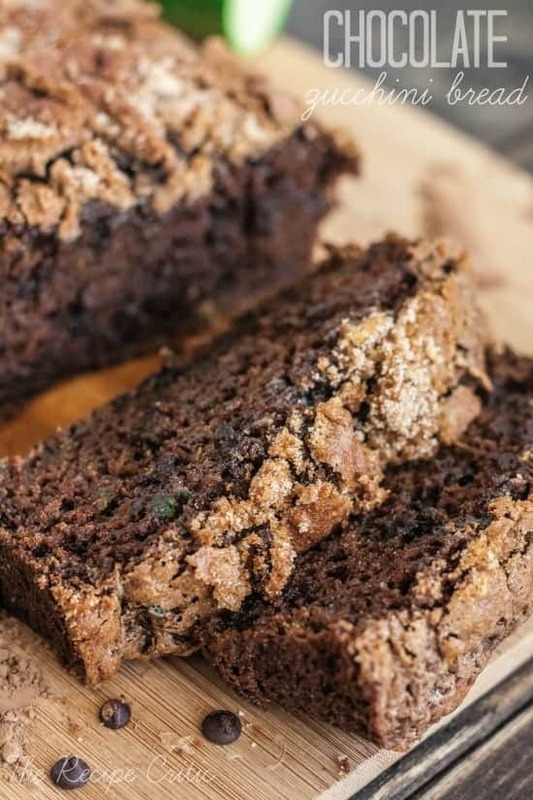 A delicious chocolate quick bread with 1½ cups of zucchini inside! It bakes perfectly and has a beautiful cracked sugar crust topping! Preheat oven to 350 degrees. Butter and flour a large 9" bread pan and set aside. Mix topping ingredients and set aside. In a stand mixer or using a hand mixer, beat together sugars, oil, and eggs for about 1-2 minutes until slightly fluffy. Add vanilla and sour cream. Fold in the grated zucchini (and zest if using). Add the remaining dry flour ingredients. Stir to combine and lastly fold in the chocolate chips. Pour into prepared 9" bread pan. Sprinkle the topping on the top. Bake for 50-60 minutes. I set a time for 45 minutes and mine was done at that time. Oven temperatures vary, so just make sure a toothpick entered in the center comes clean. Awww what wonderful neighbors! This bread looks so moist and perfect! 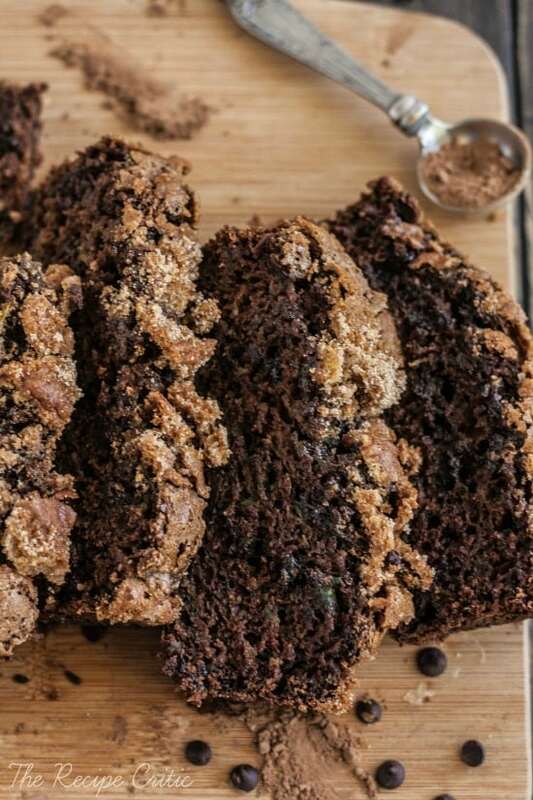 This bread looks amazing — I love chocolate and zucchini together! I have zucchini that I should use up in this form right away. Can I bake in 2 loaf pans? Wow…. I can go for a couple of slices with my morning coffee. Looks delicious, pinning! I think my family and I will love it. Being In the uk I’m not 100% sure is T a teaspoon or a tablespoon? Can’t wait to make this as I have a glut of courgettes coming! A T is tablespoon and a t is teaspoon. :). I hope you like it! Have you tried using dark mashed beans in replace of oil and eggs? I just heard that you can do this and the brownies I tried, you really couldn’t tell any taste difference. It makes them protein packed which takes away guilt! Can’t wait to sneak these past my kids. That is something I would love to they! I wonder how many mashed beans you would use?? Love chocolate zucchini and especially love generous neighbors! Looks fantastic Alyssa! Yes, yes, yes! I want this bread in my life! This looks amazing!!! This bread looks so dang good. I want a slice right now!!! I made this last night, cooled, & sliced this morning. SOOO delicious & moist thanks to the zucchini and sour cream. 1) The yummy topping on mine cracked as it cooled which meant it mostly disintegrated into chunks and pieces when I turned it over to cool on the rack. Not sure why that happened, but although it messed up the presentation a bit, wasn’t a huge deal. Thanks for the awesome recipe! definitely making again! Forget bread…this was like cake! I would classify this as the greatest chocolate CAKE I’ve ever had. It was amazing. I will never make regular chocolate cake again after this. I have made this twice first time as directed tasted great but did not keep the loaf shape. The second time I poured it in a 9×13 pan added a T more of the two sugars for the topping and a full t of cinnamon it turns out more like a coffee cake. So yummy! My boys-husband, 2.5 and 1.5 year olds love it! I have made this loaf 3 times and had to throw all of them out. I am a baker so this is not the first time I was baking. but like Jese said it did not hold its shape. The middle was still unbaked. So I used 9×13 pan and baked it for 30 to 35 min and it came out perfect. So yammy! This was amazing! I veganized it by replacing the eggs with flax eggs (1 T ground flaxseed mixed with 3 T water for each egg), and replacing the sour cream with mashed banana. It was perfect – thank you! This bread is absolutely fabulous. I made this the other night and it was a huge success with my girls. Thank you so much for sharing. I love finding new recipes to try out and anything with some nutritional value is a great plus. It worked out perfect also because I had some leftover shredded zucchini from making my Zucchini brownie recipe for my daughters birthday cake on Sunday. You can get this recipe on my blog if you are interested. Again, thank you so much for sharing. Delish!!!!!!!! Tastes just like my mama’s Italian Chocolate Christmas Cookies but in a bread! I made one substitution and used vanilla yogurt instead of sour cream. Mmmmmmmmm! I tried this recipe yesterday and they turned out great! One modification: I didn’t have sour cream so I used greek yogurt and it worked perfectly. I also just put them into mini muffin tins instead of a loaf pan. Yum! Simple and quick. left out the chocolate chips as I didn’t have any. No matter – rich and moist and yummy. Only change I’d make next time is less of the crust. It’s nice but so thick that it cracked and pieces fell off. Half the volume would work better. Came across this recipe on pinterest. Tried last night and looooooooooooooooooved it. My husband and I eat breakfast, in the car, on the way to work. I tried so hard to sneak bites of his while he was driving. So so so so so so so so so so gooood! Do you squeeze out the excess water from the grated zucchini? I don’t know if you have to or not. I just kind of scooped up the zucchini in the measuring cup and left most of the excess water. Wow! This recipe was amazing. I finally got my kids to eat zucchini bread! Even my picky husband liked it. Thanks so much for sharing this! Unbelievably delicious… Super rich and ooey gooey! I tripled the recipe and got a big bundt cake and a long loaf. Lots and lots of compliments. Thank you for sharing! Just baked your Chocolate Zucchini bread recipe using 3 small 3 x 6″ pans baked for 30 minutes in a convection oven. Delicious! Some of the crunchy crust came off when I removed bread from pans but laid it back on top. Thanks for sharing this easy to made recipe. 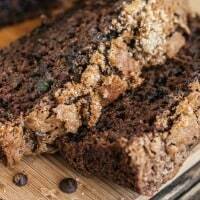 Just found this recipe for chocolate zucchini bread looks yummy. Would you be able to give me the calories? This looks awesome, is there a dairy free option? Such as replace the sour cream for coconut cream? and maybe replace the canola with coconut oil. Hit up the farmers market this weekend and they had HUGE Zucchinis there! I just finished mixing this recipe and have it baking now! I did have to make a couple substitutions, I didn’t have sour cream so used mayo instead, and I don’t use canola oil so used vegetable oil, I also cut the sugar in half, the mix tasted great before I stuck it in the oven! Thank you, we can’t wait to try this! Do you peel the zucchini before you grate it. I’ve made this a few times and it is so moist and yummy. I did sub honey for the white sugar and used about 3/4 of the baking soda since I’m cooking at high altitude. I’ve used this recipe 4 times just this season! Everytime it’s been a little different (adding banana/carrot/Greek yogurt etc) and it’s always turned out great. It’s the only zucchini bread recipe I’ll need! Wow what an awesome loaf!!! This will be a new favorite for our family. A hint to make a loaf come out nice and easy every time is to line the loaf pan with parchment paper on all sides, then put the batter in, Easy to remove and no hassle. Hi can I substitute oil for butter? I find when I bake with oil I can taste it.